Have you seen one of those old fashion percolator coffee machine sitting on a stove top burner? Most people haven’t seen an old fashion percolator coffee machine sitting on a stove burner, let alone the electric version of that same coffee machine sitting on a counter. Today, almost all coffee machine use a drip system to make a consistently perfect, cup of coffee. Among the drip coffee machine that can be found on a coffee enthusiast’s counter is the Capresso brand of coffee machines. Each Capresso coffee machine has basic features in addition to features needed to make café-quality coffee; it just depends on what type of coffee you would like to make at home. For the non-coffee enthusiast who don’t care about the perfect tasting coffee, the essential features will be sufficient, but for everyone else who wants that delicious tasting coffee, additional features will be expected. Capresso coffee machines come with a variety of features, in addition to the basics, which are on all models. For coffee drinkers who are serious coffee enthusiasts, it is worth the extra cost to get a machine with additional features. Following this should help you with a great tasting cup of coffee. We recommend that you buy whole beans from a local coffee shop and grind them at home. If you are looking for a good grinder, you can’t go wrong with this one, Cuisinart DBM-8 Supreme Grinder. Following Babbie’s rule of fifteens and using a quality grinder you’re a step closer to making your best cup of coffee. We will talk about improving your brewing skill at a later time. 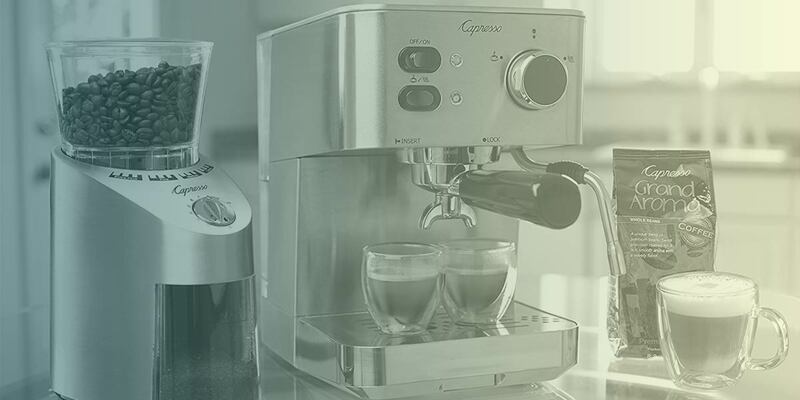 A simplistic Capresso coffee machine may not fit everyone’s needs or prevent trips to the local coffee shop, but it will make a great cup of coffee. For those who want coffee house styled drinks at home, a coffee maker with additional features should be selected.